Having watched their first ever hockey game this evening, everyone in Ireland is now an expert. 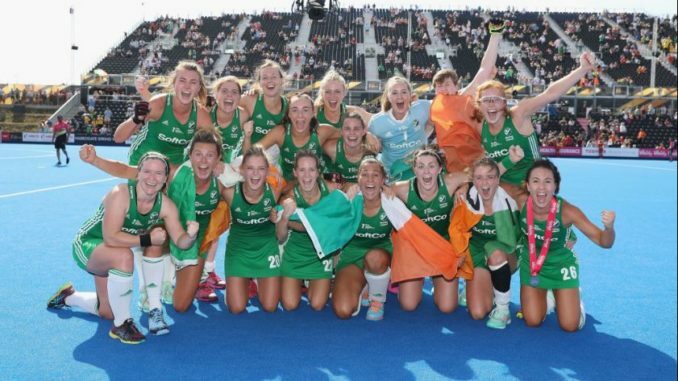 The Irish women’s hockey team reached the World Cup Final and the game was broadcast live on RTE television. Unfortunately the girls in green were were well and truly hockeyed 6-0 by the Netherlands. Soccer commentator George Hamilton was given the job of trying to convince the viewers he knew what he was talking about while covering the match. The game itself was unfortunately a very one-sided affair. The Netherlands are ranked number one in the world and have dominated women’s hockey for years. Their superiority was obvious from the start after corner back tight end wide receiver Jenny Simpson was bell-whipped for an ankle infringement in the flip zone during a throw-ball counter attack. The game was over as a contest when Ireland pucked a sidewinder into an off-shoot wobble tackle that saw goal-tender Millie Johnson expelled from the penalty area for a stick tackle which led to a kick ball penalty corner. The pitch was blue by the way. No, seriously. Blue.